It was supposed to be a regular Thursday night futsal session. I’ve never been much of a football/soccer player outside of my inter-school league in high school but I willingly got connected to the futsal club on my island. Futsal now served two purposes for me. 1. To get exercise and 2. to socialize with the locals; on this small island everybody knows everybody and the futsal team was a mixture of teachers, construction workers, housewives, ferry workers and more. So I arrive at the artificially lit multipurpose park arounf 7:25pm to see a much bigger crowd than usual. There was an aura of excitement in the air; I had no idea why at this point. I saw the usual faces but maybe 5 or so I was seeing for the first time. As usual I stood out like a raison in vanilla ice cream but by this time I was comfortable with my adopted futsal family. A cirlcle was then formed with a well-kitted out stranger in the middle. Of course I understood very few words and my brain was spazzing out trying to translate with my limited Japanese as by the time I figured one word I could almost never connect the context and as usual was struggling to understand. The way I would describe it is like I’m in a race with and in my brain and I am struggling to keep up and frustrated til I eventually give up and allow the words to wash over me as I smile and nob and clap/laugh when everyone else does. English Master: Hey Kirk! I heard all about you at the office. I know you do not understand Japanese yet. It was like a miniature version of my Todai-ji experience. Out of nowhere spouting from the face of your typical Japanese middle-aged man was the best English I have heard on the island so far. Needless to say I became stuck to him for most of the night. 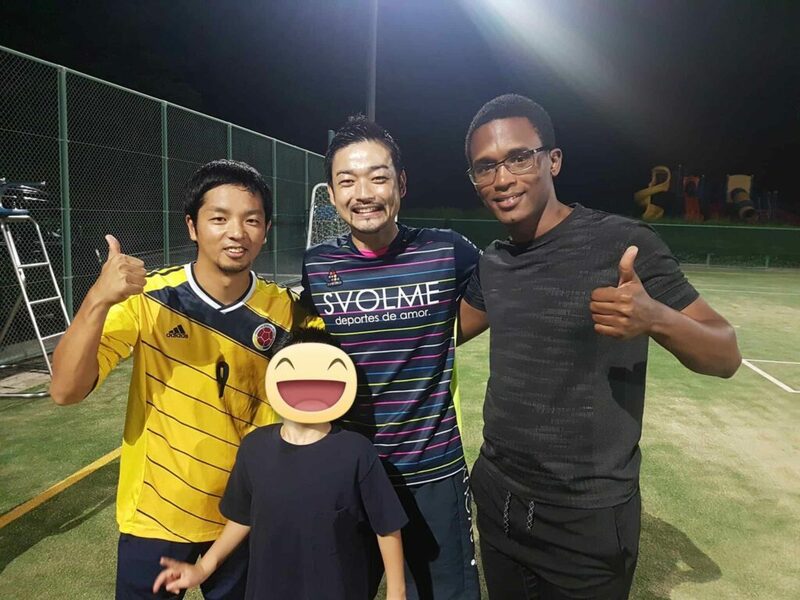 Through him I learnt that the captain of Japan`s futsal team was here on my small island playing futsal with our team! The English master who became my new friend was unbeleivable a JICA emplyee working in my town and responsible for various projects including getting such a high profile “star” to visit this far-flung island. I took some of the downtime to explain how JICA has done and continues to do great work in Jamaica. As the night went on and futsal came to an end I was invited to a gettogether after where we packed 20+ people in a small room eating and drinking. I declined the drinking part as I had work the next day but the boys (and a few of the girls) went crazy including the futsal star. Over the hours I learned so much about the English Master, his family and how he loves Jamaica and Bob Marley because many years ago he shared a room with a mexican and a Jamaican while on a business training trip. Who would have thought that such a connection would be made ramdomly. Now I`ve been invited to 2 upcoming high profile events on my island featuring a delegation from Bhutan and another with a NHK executive. Even though I rode home in the cold darkness at 2am I went to bed quite excited about those upcoming experiences while dreading that I had to wake up for work in a few hours!